Step back in time and stay in this Grade II listed period holiday cottage with its slanted walls and wonky stairs in the Medieval village of Chilham. Service rating : Ablauf und Information zur Anreise. Organisation der Reise und vor Ort Service. Product : Pures Landleben in einem ruhigen Dörfchen mit schöner Kirche und Pub. Have been to that cottage before so have used the service again already. Key where it should be, cottage clean although not sparklingly so, lady extremely helpful and pleasant when I rang to make the arrangements. China in kitchen could do with a refresh. Product : Cottage had everything we needed. The only place I have been with constant hot water. The only negative was that the radiator in the rear bedroom didn't appear to work. Well presented clean and comfortable cottage in a very pretty village. Easy driving to places of interest I.e. Canterbury and other coastal towns. Would recommend a stay here. Service rating : Service was excellent. Kept well informed . Everything went smoothly. Product : Lovely little cottage. Clean and cosy. Fantastic location for exploring Kent coast. Product : Charming 15th century cottage in fairy tale village of Chilham. Over-the-top romantic, also calm, clean, fitted out with modern amenities, and waiting for the next guest. Thank you for your feedback on your recent stay; we are pleased to have helped you find a wonderful and relaxing holiday, and hope that you consider visiting Kent again. "A lovely stay at this little cottage, Chilham is a beautiful place to stay, we had a burning log fire every night so cosy. Will visit again in Spring or Summer next year." "What a quaint cottage - a real antidote to London life - we enjoyed country walks, beers and good food - will be sorry to leave!" "What a find! 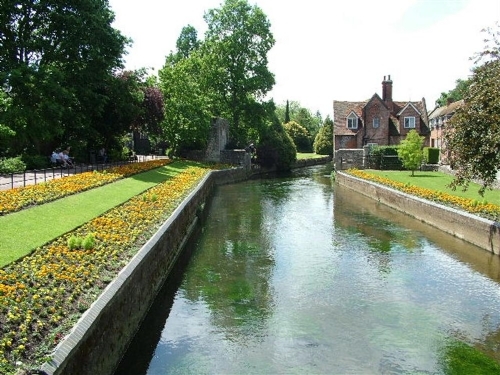 - booked this cottage as wanted to visit Canterbury, but never expected this! -what an amazingly beautiful village and cute cottage..would love to revisit and stay longer and just enjoy reading by the fire with candles..both pubs wonderful and villages very welcoming and friendly - thank you." "What a lovely spot -the village is quite unique and the cottage so quaint and well situated - we are really relaxed and had a lovely stay - thank you!" "Lovely place, cosy cottage - we spent a wonderful week at Orions cottage -loved Sissinghurst and Canterbury." "What a lovely cottage and village in which to spend out visit to Kent - delightful surroundings and excellent village pub. Lots to see and do in the surrounding area and places to visit. Our two Scottish Terriers have loved every minute . Owner and housekeeper very helpful." "What a dream - we enjoyed hosting our family and friends in this picturesque place - we got married in St Mary's and everything was perfect ! We hope to be back soon for a longer stay." "Wonderful, great cottage and amazing village to base ourselves - if we are ever back in this part of the UK , we will definitely be looking at staying again." "We had a lovely weekend. Beautiful cottage . Great food at the White Horse Pub, enjoyed it all very much." "We have had a wonderful wedding weekend here - married at St Marys church. Orions Cottage was such a wonderful place to stay during our time here. Cant wait to come back." "Such a lovely happy stay in this beautiful cottage . Two very happy and well rested people are heading back to London , thank you so much !" "A truly beautiful cottage in an ideal setting." "What a lovely village we have found and a pretty cosy cottage." "Two days was not enough for us in this beautiful lovely cottage . Cracking cottage - we will spread the word!" "What a lovely time we have in this wonderful cosy cottage especially having a real fire in the evenings. Chilham is an amazing village, one of the prettiest we have visited." "Amazing place to stay. Wonderful village, central location, good facilities." "Lovely cottage in a very pretty village." "Well what a fabulous little cottage ! - we have had a great time, and a very special Christmas here at Chilham - the scenery is simply gorgeous - thank you to the owners for the festive decorations which made us enjoy our Christmas away form home even more. We hope to visit again in the future - thank you." "Coming a long way, we suddenly found ourselves stepping back into a scene that seemed engrossed in the past. Once inside Orions Cottage, below a clear night that showed us the corresponding constellation, we found the heart and sweetness of the cottage that has been the home of many. Browsing through the titles of the library on the shelves, we found a beautiful and lovely collection of classic writing for the sensible pilgrim. Thank you for an unforgettable week." "A very relaxing few days in your beautiful cosy cottage - Good walking right outside the door !" "A lovely cottage in a terrific location - many thanks for a pleasant stay." "A lovely short break for our wedding - we used the cottage for the base for our ceremony - the gorgeous nooks and crannies of the cottage provided much inspiration for our photographer ,whilst the bride got ready." "Had a wonderful week in Orions Cottage - sad to leave, but do so with lovely memories." "We had a lovely relaxing stay at Orions Cottage and would certainly re visit." "We had a wonderful stay - the cottage is beautiful and very comfortable. Chilham is a fantastic village . All in all a fantastic week in Kent - we will defiantly be back." "We loved the house, Chilham and the surroundings - thank you for a lovely stay." "Thank you for everything and we hope we will shall not make it too long before we come over again." "Had a great 2 weeks pretending that we lived in the square! Doves cooing woke us gently in the morning, better than any alarm clock! Goodbye Chilham, you will always hold a place in our hearts." "An excellent cottage - everything works! Beds were good and the garden peaceful - first rate !" "Fabulous, calm and peaceful - 2 days that flew by in a frenzy of calm - we had a lovely time in a beautiful cottage - Thank you!" "Thank you so much for the splendid time - travel in your picturesque cottage - enjoyed cream tea next door and even with the rain showers, the surrounding landscape was an absolute pleasure to walk in and look at." "Comfy cottage and great location." "Nice cottage, great location - visited all 3 eating establishments in the village and all good and different." "We had a great holiday in your lovely cottage and beautiful Kent in springtime." "We had a lovely week in this very cosy cottage and didn't need to bring anything as everything we needed was on hand - lovely setting and thank you for a lovely stay." "What a fantastic cottage - we felt like we had stepped back in time - facilities very good and beds incredibly comfortable and we enjoyed every moment we spent here. The village is picturesque and locals very friendly. We would like to return and explore further." "We loved the cottage - it was nice warm, cosy and comfortable - we made a log fire every night which was very special for us - Chilham is a lovely village to spend a few days and we had a super holiday"
"We had a really lovely relaxing time - yes cosy ..There are great walks right from the front door - thank you it was great.."
"We had a good time - thanks for the cosy cottage"